I bought this as a present for my granddaughter. She was totally thrilled! Her mother was impressed with the quality of the material. I would say it was a total win for the G-ma! So my friend's toddler loves this YouTuber called PerryGrip, and he has a song called "Space Unicorn." That unicorn delivers a rainbow all around the world. That song is this little girl's FAVORITE song. When she gets this shirt for Christmas she is going to lose her mind! I can't wait! I bought this shirt for my daughter. 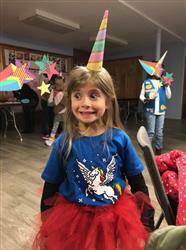 It was the perfect outfit for her Unicorn Dance Party event for Girl Scouts. She calls it her Minecraft Unicorn shirt. I loved telling people about Svaha when they complimented her on her shirt. We loved this shirt. I especially like the soft feel of the fabric and the cut for the shirt. The design is very cute! This royal blue, organic cotton, short-sleeve kids' t-shirt is screen-printed with an Artificial Intelligence (A.I.) design. Available in kids' size 2 years -11/12 years.